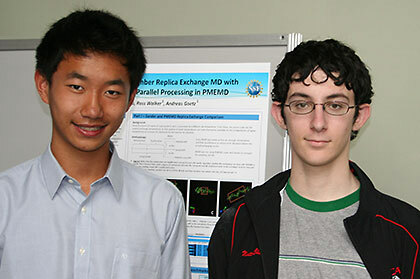 The San Diego Supercomputer Center (SDSC) at the University of California, San Diego, will once again offer its Research Experience for High School Students (REHS) summer program, in which students will be integrated into multidisciplinary research teams to help them gain experience in particular areas of computational research. Now expanded to eight weeks, the program will be held June 23 through August 15, 2014 at SDSC. Internship hours, which typically range from 15 to 25 hours a week, will be coordinated with SDSC principal investigators who serve as mentors in the program. Specific research opportunities will be posted to the SDSC Education website on February 18. The application deadline for students is March 14, with final PI-student selections to be completed by April 15. Now in its fifth year, REHS is seen as a stepping stone for students who would like to pursue a computational science curriculum as they enter college. The summer program has grown substantially, with the number of student applications growing to 225 from 75 the first year. “This heightened interest tells us that more students are not only becoming aware of, but gravitating toward the field of computational sciences as a potential career choice,” said Mason, who helped coordinate internships for almost 40 students during last year’s program, which is the level that can currently be supported by SDSC’s PIs. Eligible participants are high school students in their junior or senior year who are at least 16 years old, possess a valid work permit if under the age of 18, and are a citizen or permanent resident of the United States or its possessions. Students must have a GPA of 3.0 or higher and must be enrolled in an accredited area high school. Students will be given the opportunity to meet weekly with each other as a group to share experiences and social time in an effort to provide a well-rounded internship experience.